If you need a garage or shed in a hurry, this high quality portable structure is your solution. 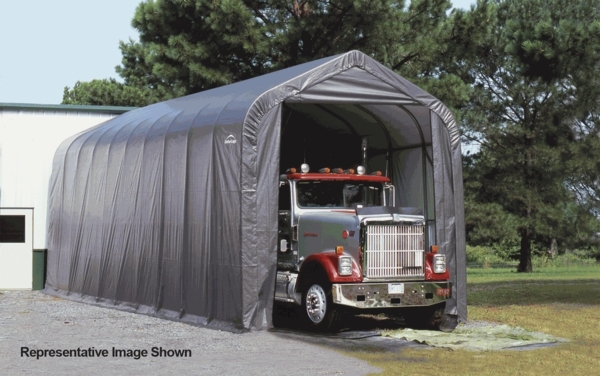 This Peak Style Portable Shelter is ideal for storing and protecting your trucks, cars, boats, tractors, farm machinery, yard equipment or outdoor supplies. This Peak Style Portable Shelter is sturdy and durable. It features Ratchet Tite technology to keep the polyethylene cover smooth and tight over the steel frame. The entire structure is anchored with thirty inch augers. What is the composition of this item? The frame is sturdy 2 3/8" diameter steel frame, and the top is made of UV-treated, commercial-grade 9 oz, and a woven polyethylene cover. What is the width of the door opening? The opening width of the door is 10 feet. Thank you. How hard are these portable shelters to put up? I have a tri-axle dump truck that is a little over 11 feet high. 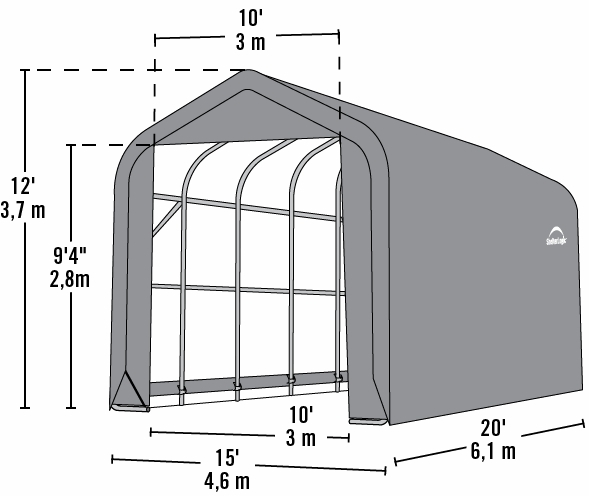 What are the height of these shelters? The door height on this shelter is 9'4", and the peak height is 12'. The installation will involve a certain degree of difficulty, but should not be hard for a few people working together. What is the height of the door opening for this portable shelter? The height of the door opening is 9'4".